These performances are famous, and famous performances tend to show up often and in various places. Opus Kura is a Japanese label distributed here in the United States by Albany Music, and they are well-known for excellent transfer work. The three symphonies here have already been reissued by this very label – and others – but this is the most recent re-mastering to my knowledge. As for the music, it's very fine and worth having. 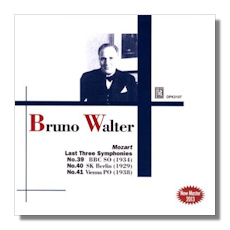 Collectors know Bruno Walter mostly from his Columbia days, where the aged maestro did some of his finest work at the end of his career. Indeed, Sony/BMG has done a very good job recently of paying tribute to his legacy; after virtually ignoring his work after the Bruno Walter Edition, recent box sets have really paid him his due. He recorded this music several times, and his efforts on behalf of Mozart are loved all around the world. His monophonic discography has been explored by Dutton and EMI (now Warner Classics). In short, we are spoiled for choice, this despite the fact that Walter gets little attention these days in an age of globetrotting baton-wavers. All the same, this disc is a gem. None of the three ensembles is in especially good shape; World Wars will do that to you. And yet, it is consistently quality music making that is on display here. The Mozart Symphony #39 is a fabulous reading, full of warmth and vigor. If the strings are sour here and there, you can still bask in some lovingly phrased first-desk playing and a glowing Andante. The whirlwind finale is also a highlight. Walter perfectly balances his own romantic tendencies with a firm grasp of the music's classical idiom. The sound is hissy, but the ear adjusts. A treat. The Symphony #40 is somewhat less special. For one, Staatskapelle Berlin sounds malnourished and bereft of tonal appeal. For two, Walter is a little more leisurely than previously. Again though, there are definite bright spots. Yes, that famous theme sounds slower (and more sour) than modern ears are accustomed to, but how pleasingly Walter frames the winds with the strings. There's also a tension and drama at play that is sometimes missing in modern versions. Another tender slow movement follows, despite some ugly playing here and there. The Menuetto is well-shaped by the conductor, but is far too coarse and clunky to really take flight. The Allegro is far superior, taken swiftly and with urgency. Not quite a winner. The Symphony #41 finishes the disc in a satisfying fashion. The Vienna Philharmonic plays well enough to convey Walter's vision. The strings were having a good day, and only the brass really sound unpleasant. Like the Symphony #39, there is an appealing combination of classical elegance and romantic warmth. Walter would later perfect this approach in California and New York, but there was always a special relationship between conductor and this orchestra. Inner movements are beautiful – this particular Menuetto goes much better – and the finale is surprisingly measured, but also full of character and conviction. This release is a must for fans of the conductor and historical Mozart.